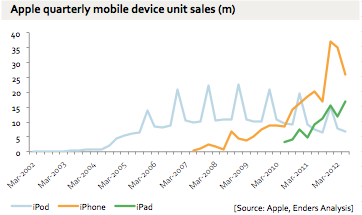 Three Apple charts I’m pondering this afternoon. 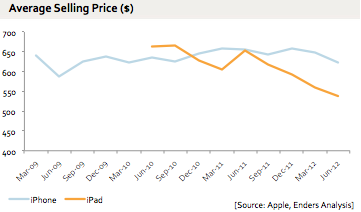 Timing, inventory, China… and the iPad ASP is down from $662 to $538 since launch. 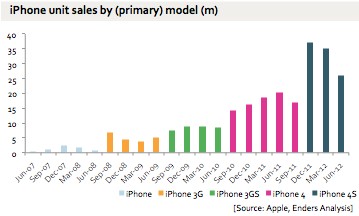 The 4S was launched in the west in the Christmas quarter and in China in the Chinese New Year quarter, both big purchasing seasons. Meanwhile the 2 year contract model will make this self reinforcing over time: people who buy in a launch quarter will come off contract in another launch quarter. That will be especially important as the mix moves from new users to replacement. In other words, this sort of lumpiness is inherent in the ‘one big product a year’ model, but there are a number of technical factors amplifying it.